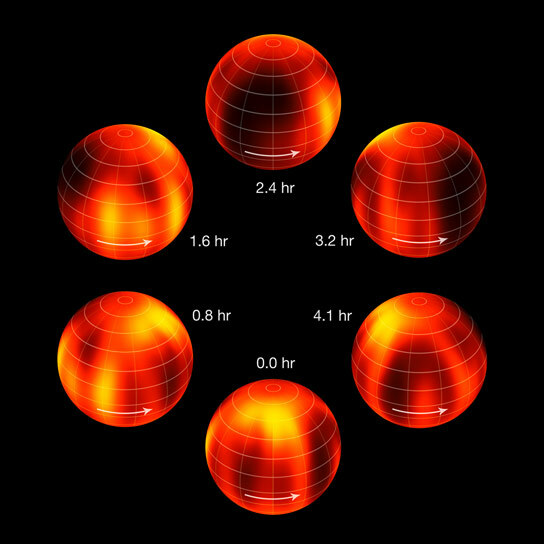 ESO’s Very Large Telescope has charted the first ever map of the weather on the surface of a Brown Dwarf. An international team has made a chart of the dark and light features on WISE J104915.57-531906.1B, which is informally known as Luhman 16B and is one of two recently discovered brown dwarfs forming a pair only six light-years from the Sun. The new results are published in the 30 January 2014 issue of the journal Nature. The closest brown dwarfs to the Solar System form a pair called Luhman 16AB  that lies just six light-years from Earth in the southern constellation of Vela (The Sail). This pair is the third closest system to the Earth, after Alpha Centauri and Barnard’s Star, but it was only discovered in early 2013. The fainter component, Luhman 16B, had already been found to be changing slightly in brightness every few hours as it rotated — a clue that it might have marked surface features. The atmospheres of brown dwarfs are very similar to those of hot gas giant exoplanets, so by studying comparatively easy-to-observe brown dwarfs  astronomers can also learn more about the atmospheres of young, giant planets — many of which will be found in the near future with the new SPHERE instrument that will be installed on the VLT in 2014. This pair was discovered by the American astronomer Kevin Luhman on images from the WISE infrared survey satellite. It is formally known as WISE J104915.57-531906.1, but a shorter form was suggested as being much more convenient. As Luhman had already discovered fifteen double stars the name Luhman 16 was adopted. Following the usual conventions for naming double stars, Luhman 16A is the brighter of the two components, the secondary is named Luhman 16B and the pair is referred to as Luhman 16AB. Hot Jupiter exoplanets lie very close to their parent stars, which are much brighter. This makes it almost impossible to observe the faint glow from the planet, which is swamped by starlight. But in the case of brown dwarfs there is nothing to overwhelm the dim glow from the object itself, so it is much easier to make sensitive measurements. Be the first to comment on "ESO’s VLT Charts First Map of Weather on the Surface of a Brown Dwarf"